It’s common to get some problems with your swimming pool tiles after a long-time use. 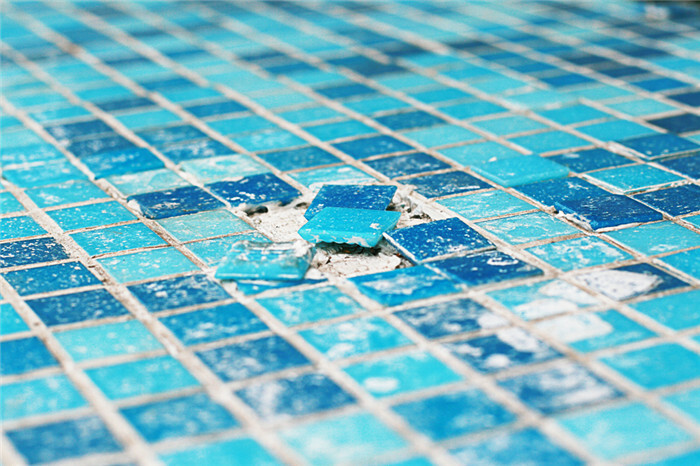 You may find some cracked tiles or chipped tiles in your pool and few is falling off from the surface. It is necessary to make a complete re-tile of swimming pool each 20 years. While you can first do some simple and quick repairs to prevent your swimming pool tiles falling off again. Using some simple tools, you can do small simple repairs on your own in a short time. Just read the following tips. 1. Remove the loose mosaic tiles with a small flathead screwdriver. And use small pliers to remove the grout stuck onto the pieces’ sides. Remember that any old grout which remains stuck to the tile’s edge. 2. Remove any loose and flaking material from the wall behind the mosaic tiles. If you find cracks in the pool wall area behind the tile, these should be opened up, and fill it with hydraulic cement, pushing the cement as far back as possible into the crack. Pay focus on those large cracks that are likely to cause your mosaic tiles falling off in the first place. If the area is uneven with missing chunks of material, it also should be filled with a pool plaster mix, so that we have a smooth base to set the mosaic tile against. Notice that not to build up the area too much, so that the new mosaic tiles will be with the tiles on either side. If possible, preserving the plaster’s ledge at the bottom of mosaic tiles, can support the mosaic tiles wile the mortar dries. 3. Mix up a small batch of thin set mortar. Wet the area you want to tiling before applying the thin set. Something like peanut butter will appear after mixing to a spreadable consistency. Then use a notched trowel to spread the mix in an even, thin coating. Spread the mixture on the area that you can reasonably affix the mosaic tiles within a few minutes. Generally, large mosaic tiles will be easier to set than small mosaic tiles. Press the pool tiles firmly into the thinset mortar wall until it squeezes out from behind. Do the work fast before the mortar begins to dry. A cooler environment would be preferred. Check the previous work after setting the pool mosaic tiles pieces every 10 minutes or so. You may find our some tile pieces begin to slide down the wall, just push the tile back into position without a lot of motions. Vertical pieces of duct tape can be used to help tape large tiles stop falling off and be in place temporarily. 4. Gout the tiles. Use a waterproof tile grout to seal all spaces in between mosaic tile after the tile has been set in place for 24 hours. Use a flexible spreader to push the grout, after 10 to 15 minutes, take some water to clean up the extra grout that smeared onto the tiles. After 24 hours, you can use a stiff brush to remove the haze and polish the tiles. 5. Finally, fill the swimming pool back up, and your work gets done!